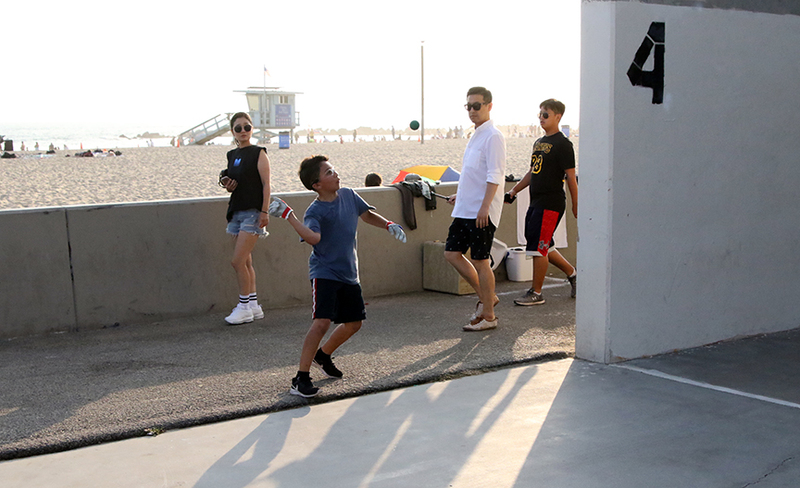 VENICE BEACH, Calif. — The 2018 USHA National Junior 3-Wall Championships wrapped four-straight days of small ball and big ball singles and doubles at the Venice Beach Rec Center late Sunday afternoon. Many of the top seeds advanced to finals in four divisions, giving them a huge workload on the final day. Jesus Mendez of Los Angeles made a huge splash at last year’s juniors, winning the 15-Under Big Ball and Small Ball crowns. This year, Mendez topped his previous feat, winning the Boys 17-Under Small and Big Ball singles and the Boys 19-Under Small and Big Ball doubles (hauling in four first-place medals!). Andrew Garcia (pictured swinging against Luis Mendez in the small ball final) came close, winning three divisions before narrowly losing in the 19-Under Big Ball Doubles final to Mendez and Eddie “Toro” Rocha, 15-3, 12-15, 15-13. Garcia, playing in six matches on Sunday won the Boys 19-Under Small Ball singles, Big Ball singles and Small Ball doubles. After winning 15-Under One-Wall titles in New York last month, David Sanchez slammed 15-Under Small Ball crowns on Sunday, defeating Fermin Victoria, 15-4, 15-0. In the 13-Under Small Ball final, Luis Fernandez of Santa Barbara edged Andres Cordova of Juarez, Mexico, 15-9, 10-15, 15-7. It was another tremendous National Junior 3-Wall Championships, hosted by the Southern California Handball Association. Kids were treated with amazing backpacks, shirts and hats as well as a BBQ lunch each day at the beach. A special “thank you” to the volunteers who braved the beach traffic and hot sun throughout the event: Marcus Hough, Mark Zamora, Roy Harvey and many others. See the updated draws and results HERE.